Mandela's father was destined to be a chief and for years served as a counselor to tribal chiefs. But over a dispute with the local colonial magistrate, he lost his title and his fortune. Rolihlahla was only an infant at the time and the loss of status forced his mother to move the family to Qunu, an even smaller village north of Mvezo. The village was nestled in a narrow grassy valley. There were no roads, only foot paths that linked the pastures where livestock grazed. The family lived in huts and ate a local harvest of maize, sorghum, pumpkin and beans, which was all the family could afford. At the suggestion of one of Rolihlahla's father's friends, he was baptized into the Methodist church and became the first in his family to attend school. As was the custom at the time, and probably due to the bias of the British educational system in South Africa, his teacher told him that his new first name would be "Nelson." Mandela's father died of lung disease when Nelson was 9 years old. From that point, his life changed dramatically. He was adopted by Chief Jongintaba Dalindyebo, the acting regent of the Thembu people. This gesture was done as a favor to Nelson's father who, years earlier, had recommended Jongintaba be made chief. Nelson left the carefree life he knew in Qunu, fearing he would never see is village again. When Mandela was 16, it was time for him to partake in the circumcision ritual that would carry him into manhood. The ceremony of circumcision was not just a surgical procedure, but an elaborate ritual in preparation for manhood. In the African tradition, an uncircumcised male could not inherit his father's wealth, marry or officiate at tribal rituals. Mandela participated in the ceremony with 25 other boys. He welcomed the opportunity to partake in his people's customs and felt ready to make the transition from boyhood to manhood. But during the proceedings, Chief Meligqili, the main speaker at the ceremony, spoke sadly of the young men, as a generation enslaved in their own country. Because their land was under the control of the white man, they would never have the power to govern themselves. The chief went on to lament that the promise of the young men would be squandered as they struggled to make a living and perform mindless chores for the white man. Mandela would later say that that the chief's words didn't make total sense to him at the time, but they would work on him and would eventually formulate his resolve for an independent South Africa. We all know he became an activist and a prisoner and later the first black South African president but what hits me is that retired from Public life in June 1999 and currently resides in his birth place - Qunu, Transkei (the place he though the would never see again). Observe the symmetry of events. when things seem out of our control and it looks like life is answering "Yes" to the rhetorical question of whether things can get any worse God is there. We never know where God is taking us, but the scriptures say His plans for us are good. I finally realised the reason I was so inspired by his story, was my interpretation of his beliefs and traits shaped by events from his past. I asked this question of a very dear mentor of mine. “How can I lead in my small way, when all my inspiration comes from people who have changed the world, it seems overwhelming?” What he said to me can also be true for people in every field. 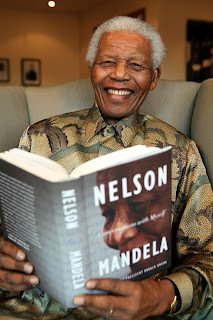 He said, “Don’t concentrate on the world; apply your beliefs, principles and values to your world and the rest will take care of itself.” I felt a glimmer but wasn't convinced until I watched Madiba's documentary about his impossible mission and suddenly the impossible was possible, and the final piece of the jigsaw slotted into place. The bigger the test, the bigger the testimony.